Last year ‘Alix Bosco’, the pseudonym for a ‘successful writer in other media’, burst onto the New Zealand fiction-writing scene with the acclaimed CUT & RUN, a thriller that is a finalist for the inaugural Ngaio Marsh Award for Best Crime Novel. Bosco’s compelling debut, which introduced overworked social worker turned legal researcher turned unintentional sleuth Anna Markunas, has also been tabbed for TV adaptation, with Robyn Malcolm (Outrageous Fortune) in the lead. Middle-aged and multi-layered Markunas is now back in SLAUGHTER FALLS, although this time instead of the mean streets of South Auckland she finds herself caught up in a puzzling death while holidaying in sunny Queensland. A weekend of revelry and rugby watching sours terribly when two members of Markunas’s tour party die sudden, violent deaths. As Markunas tries to track down the elusive family of one of the men, she finds herself entangled in the secret histories and ongoing corruption of the Sunshine State’s seedy underbelly. At the same time unexpected revelations about her own background come to light. 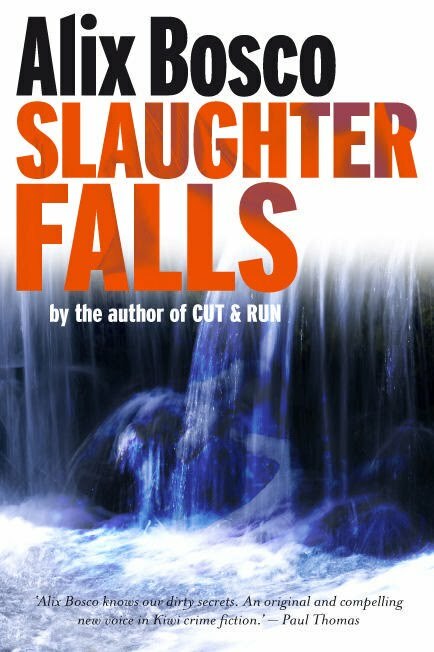 SLAUGHTER FALLS has plenty of the tension (both in terms of the plotline and Markunas’s personal life), visual storytelling, and vivid action-packed moments readers loved in CUT & RUN, but is a more personal, character-based novel. While it doesn’t quite scale the thrills and mystery heights of Bosco’s debut, this sophomore effort further develops Markunas as an intriguing character worth following as the series grows. An enjoyable read. This review was first published in the October 2010 issue of WildTomato, the magazine of Nelson and Marlborough. You can read more about this terrific magazine here.